UK Media XI has started its batting against Pakistan XI in Peace Cup match in North Waziristan. Earlier, Pakistani batsmen thrashed UK Media bowlers all aorund the ground and scored 254 in twenty hours. Pakistan XI batted first against UK Media XI in Peace Cup 2017 match in Younis Khan Stadium of North Waziristan of Federally Administered Tribal Areas (FATA). 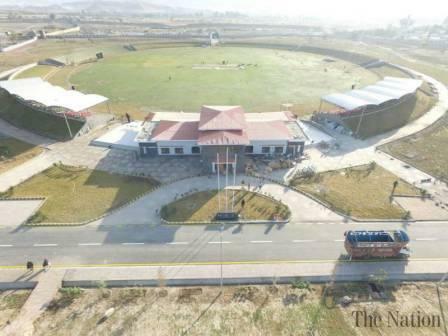 To showcase peace and stability in North Waziristan, this is first match of series between both teams being arranged by Pakistan Army, Pakistan Cricket Board (PCB) and PSL franchise Peshawar Zalmi. Pakistan's top current and former players including Younis Khan, Inzamam ul Haq, Umar Gull, Junaid Khan, Shahid Afridi, Kamran Akmal, Riaz Afridi and Wajahatullah are in action for this series. The UK team is part of an 18-member group of journalists, lawyers, businessmen and academics aged between 21-62, which is touring Pakistan with the aim to improve the country's image as a sporting nation. Of the 18 members of the squad, 14 are players, one is an umpire while the rest, including two women, are the organisers. Director General ISPR Major General Asif Ghafoor is also present in the stadium. Furthermore, While talking to media, Chief Selector Inzamam-ul-Haq stated that this is a great message for the world. "This shows that Pakistan is stable and peaceful and whole world need to know this," he said. Earlier, Peshawar Zalmi owner welcomed both teams tweeting "Welcome to peace land"